Bright and cheerful red-gold decorations, mandarin oranges, fancy red dress and the most awaited red envelopes (ang pao) are among items that are enliven this weekend festive moment; the Chinese New Year or also known as Spring festival. From firecrackers to fortune cookies, flying dragon to lion dance (Barongsai), with red being the prevailing color, it’s the weekend to welcome the lucky Year of the Horse. Roughly about 4%-5% of Indonesian citizens are of Chinese descent and the Lunar New Year is one of the most celebrated events in the country. The 15-day festival is known locally as Imlek where Chinese Indonesians of many different ethnic backgrounds and religions mass to temples to pay respect to their ancestors. 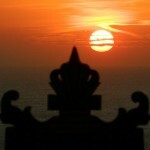 Over the course of history, Bali has experienced encounters with people from China. This relationship has developed into cultural assimilation. 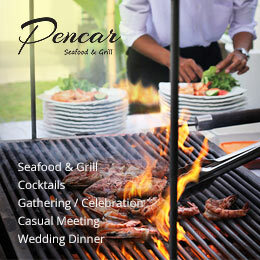 Bali has taken some influences from China and slowly merged it into its own culture and vice versa. 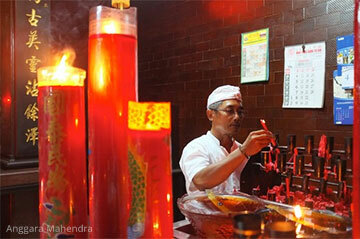 The celebrations of Chinese New Year in Bali will also take place in various Buddhist temples, or Kongco across Bali. If you happen to travel to Bali, below are 5 Buddhist temples that you can visit during this Spring festival period in Bali. 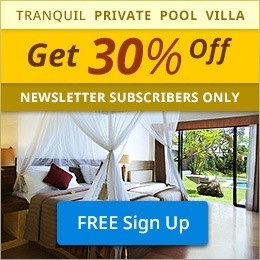 If you are staying in a hotel in Kuta, Legian or Seminyak, the first two temples below are the nearest. Vihara Dharmayana is established in 1876, making this as one of the oldest Buddhist temples in Bali and also the only Buddhist temple in the Kuta area. 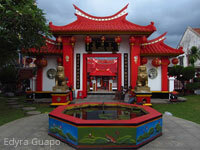 The temple is a must stop to learn about the history of Chinese citizens in Kuta, and Bali in general. Even, in 1982, the prominent figure in the world, Dalai Lama, visited the temple. Every year, the Chinese community of Banjar Dharma Semadi holds special celebration at Vihara Dharmayana to celebrate the Chinese Lunar New Year with several art performances, including Barongsai (Lion dance) and Naga Liong or known as dragon dances. 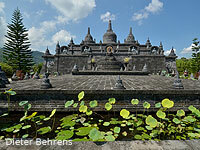 The celebration at this temple usually attracts hundreds of audience, including domestic and foreign tourists. 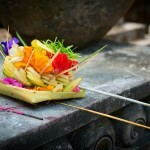 This year, you can see those special temple celebration and art performance is on January 31st. 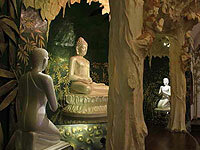 This is the nearest Buddhist temple that you can visit if you stay around Seminyak. 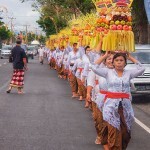 The temple was newly built in 2007 and ever since has become an important center for local and international Buddhist community activities in Bali. 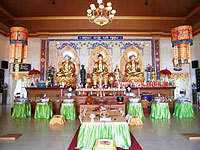 The temple is open to every Buddhist and everyone for meditation, ceremonies, or spiritual teaching, with several monks from all different Buddhist tradition coming to give teaching at the temple. The temple is located inside the two-hectare slice, in a dedicated worship complex of five different religions known as Puja Mandala. 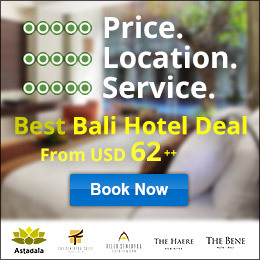 The place is home to a Buddhist temple, a Hindu temple, a Catholic Church, a Protestant Church, and an Islamic mosque altogether at the same row which reflects the essence of religious tolerance in Bali. 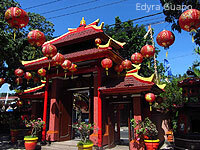 Ling Gwan Kiong is a beautiful Chinese temple situated near the harbor in the Singaraja region, northern part of Bali. The temple is decked in the lucky color of red, and clamped by mythical Chinese dragons, boasting its Chinese roots. Uniquely, some of the original buildings was built by the Dutch and they are still present and architecturally brilliant until now. Every year on Chinese New Year, the Ling Gwan Kiong temple hosts traditional prayers, followed by the much loved festivities such as dragon dancing and spectacular fireworks. Situated beautifully on the hilly area at Buleleng regency, about 22 km west of Singaraja city and 11 km from tourist spot, Lovina, the temple is the largest Buddhist temple in Bali. The temple has some meditation rooms, libraries, beautiful gardens, and an impressive mini replica of the world’s largest Buddhist archaeological site, Borobudur, on its highest grounds. The entrance fee is free, including the sarongs you may need to enter the temple, but donations are welcome. The temple is a good spot to visit during Chinese New Year or Spring Festival, especially for you who want to explore the northern side of Bali. The temple scenery is wonderful, perched on a slope of a hill and majestically overlooking a sea with lush green hill as a background.